DIE Sabbati, 30 die Julii, post meridiem. and for Ammunition, &c. to be sent into Ireland. Letter from the King to the Queen, stopped and sent up by the Earl of Warwick. Message to the H.C. for a Conference about it. and for Sir G Gerrard to be Treasurer of War. Lord Mayor, &c. to attend on Monday. Master of the Rolls Leave to be absent. Affidavits of Words against the Earl of Warwick, by Captains Slingsby and Wake. Wool for the Use of the French King. Ship for the French Ambassador's Wife, &c.
Affidavit concerning Words spoke by Lieutenant Bodley, about the Safety of London. Message from the H. C. for the Committee of Safety to meet, and peruse Letters. and for a Reply to the King's Answer about Hull. Report of the Letters read by the Committee of Safety. Order for executing the Propositions for raising Money and Horse in Huntingdon. The Lord Kymbolton was appointed to be Speaker this Day. 2. 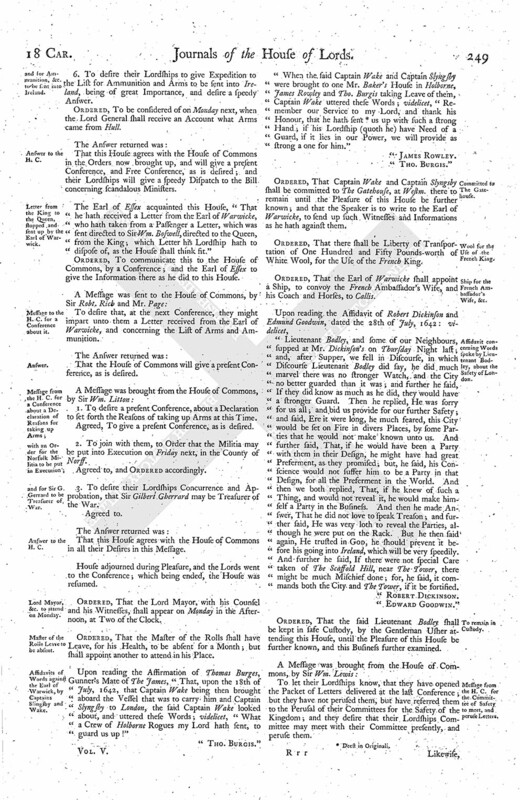 To have a Committee, to join with a Committee of the House of Commons, to examine the Actions and Proceedings of the Commissioners nominated in the Commissions of Array, and their Adherents; and that such Witnesses as shall be produced upon any of the Premises may be examined upon Oath. 3. That, in regard that the Lord Herbert is sick, and a Stranger in the County of Monmouth, and that they have received Information that the Commission of Array is put into Execution there by the Earl of Worcester; the House of Commons desires their Lordships to join with them, to nominate and approve of the Earl of Pembrooke to be Lieutenant of the Counties of Monmouth, Brecon, and Glamorgan; and that the Earl of Pembrooke be directed to grant forth his Deputations forthwith for all these Counties; and that Sir Edmund Morgan, and Henry Herbert, Esquire, may be Deputy Lieutenants for the County of Monmouth. Agreed to with the House of Commons, and Ordered accordingly. 4. To desire a Conference, concerning the Safety of the Kingdom; also a Free Conference, when their Lordships shall please, concerning some Alterations in the Bill concerning Innovations. Agreed, To give a present Conference for both. 5. To desire Expedition against scandalous Ministers. Their Lordships will give a speedy Dispatch. 6. To desire their Lordships to give Expedition to the List for Ammunition and Arms to be sent into Ireland, being of great Importance, and desire a speedy Answer. Ordered, To be considered of on Monday next, when the Lord General shall receive an Account what Arms came from Hull. That this House agrees with the House of Commons in the Orders now brought up, and will give a present Conference, and Free Conference, as is desired; and their Lordships will give a speedy Dispatch to the Bill concerning scandalous Ministers. The Earl of Essex acquainted this House, "That he hath received a Letter from the Earl of Warwicke, who hath taken from a Passenger a Letter, which was sent directed to Sir Wm. Boswell, directed to the Queen, from the King; which Letter his Lordship hath to dispose of, as the House shall think fit." Ordered, To communicate this to the House of Commons, by a Conference; and the Earl of Essex to give the Information there as he did to this House. To desire that, at the next Conference, they might impart unto them a Letter received from the Earl of Warwicke, and concerning the List of Arms and Ammunition. That the House of Commons will give a present Conference, as is desired. 1. To desire a present Conference, about a Declaration to set forth the Reasons of taking up Arms at this Time. Agreed, To give a present Conference, as is desired. 2. To join with them, to Order that the Militia may be put into Execution on Friday next, in the County of Norff. 3. To desire their Lordships Concurrence and Approbation, that Sir Gilbert Gberrard may be Treasurer of the War. That this House agrees with the House of Commons in all their Desires in this Message. Ordered, That the Lord Mayor, with his Counsel and his Witnesses, shall appear on Monday in the Afternoon, at Two of the Clock. Ordered, That the Master of the Rolls shall have Leave, for his Health, to be absent for a Month; but shall appoint another to attend in his Place. Upon reading the Affirmation of Thomas Burges, Gunner's Mate of The James, "That, upon the 18th of July, 1642, that Captain Wake being then brought aboard the Vessel that was to carry him and Captain Slyngsby to London, the said Captain Wake looked about, and uttered these Words; videlicet, "What a Crew of Holborne Rogues my Lord hath sent, to guard us up!" "When the said Captain Wake and Captain Slyngsby were brought to one Mr. Baker's House in Holborne, James Rowley and Tho. Burgis taking Leave of them, Captain Wake uttered these Words; videlicet, "Remember our Service to my Lord, and thank his Honour, that he hath sent (fn. 1) us up with such a strong Hand; if his Lordship (quoth he) have Need of a Guard, if it lies in our Power, we will provide as strong a one for him." Ordered, That Captain Wake and Captain Slyngsby shall be committed to The Gatehouse, at Westm. there to remain until the Pleasure of this House be further known; and that the Speaker is to write to the Earl of Warwicke, to send up such Witnesses and Informations as he hath against them. Ordered, That there shall be Liberty of Transportation of One Hundred and Fifty Pounds-worth of White Wool, for the Use of the French King. Ordered, That the Earl of Warwicke shall appoint a Ship, to convoy the French Ambassador's Wife, and his Coach and Horses, to Callis. "Lieutenant Bodley, and some of our Neighbours, supped at Mr. Dickinson's on Thursday Night last; and, after Supper, we fell in Discourse, in which Discourse Lieutenant Bodley did say, he did much marvel there was no stronger Watch, and the City no better guarded than it was; and further he said, If they did know as much as he did, they would have a stronger Guard. Then he replied, He was sorry for us all; and bid us provide for our further Safety; and said, Ere it were long, he much feared, this City would be set on Fire in divers Places, by some Parties that he would not make known unto us. And further said, That, if he would have been a Party with them in their Design, he might have had great Preferment, as they promised; but, he said, his Conscience would not suffer him to be a Party in that Design, for all the Preferment in the World. And then we both replied, That, if he knew of such a Thing, and would not reveal it, he would make himself a Party in the Business. And then he made Answer, That he did not love to speak Treason; and further said, He was very loth to reveal the Parties, although he were put on the Rack. But he then said again, He trusted in God, he should prevent it before his going into Ireland, which will be very speedily. And further he said, If there were not special Care taken of The Scaffold Hill, near The Tower, there might be much Mischief done; for, he said, it commands both the City and The Tower, if it be fortified. Ordered, That the said Lieutenant Bodley shall be kept in safe Custody, by the Gentleman Usher attending this House, until the Pleasure of this House be further known, and this Business further examined. 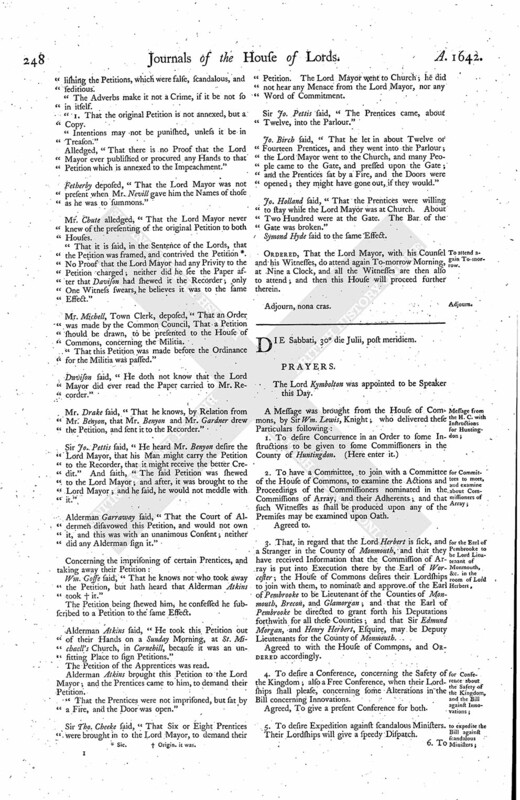 To let their Lordships know, that they have opened the Packet of Letters delivered at the last Conference; but they have not perused them, but have referred them to the Perusal of their Committees for the Safety of the Kingdom; and they desire that their Lordships Committee may meet with their Committee presently, and peruse them. Likewise, that the House of Commons desires their Lordships to join and concur with them in a Replication to His Majesty's Answer concerning Hull. That the Committee of this House shall meet presently with the Committee of the House of Commons, to peruse the Letters; and that their Lordships will take the Replication into speedy Consideration. The Lords Committees went presently, to meet with the Committee of the House of Commons. The Lords Committees reported and read the Letters in the Packet. 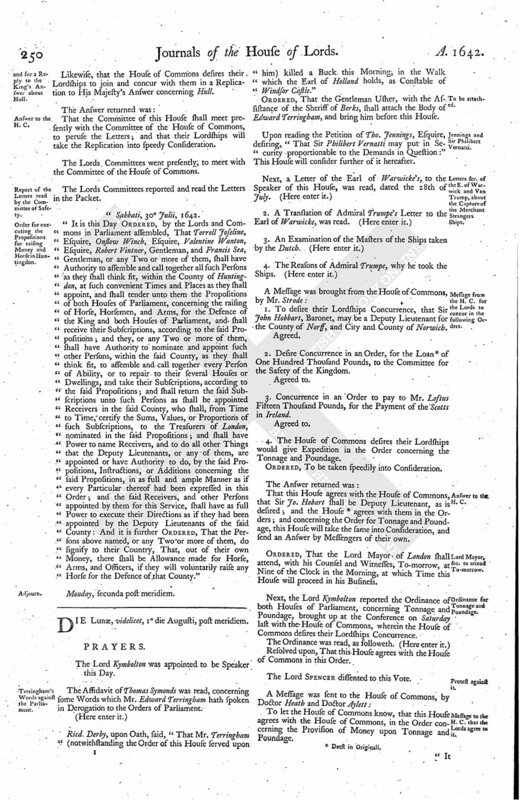 "It is this Day Ordered, by the Lords and Commons in Parliament assembled, That Torrell Joseline, Esquire, Onslow Winch, Esquire, Valentine Wanton, Esquire, Robert Vintner, Gentleman, and Francis Sea, Gentleman, or any Two or more of them, shall have Authority to assemble and call together all such Persons as they shall think fit, within the County of Huntingdon, at such convenient Times and Places as they shall appoint, and shall tender unto them the Propositions of both Houses of Parliament, concerning the raising of Horse, Horsemen, and Arms, for the Defence of the King and both Houses of Parliament, and shall receive their Subscriptions, according to the said Propositions; and they, or any Two or more of them, shall have Authority to nominate and appoint such other Persons, within the said County, as they shall think fit, to assemble and call together every Person of Ability, or to repair to their several Houses or Dwellings, and take their Subscriptions, according to the said Propositions; and shall return the said Subscriptions unto such Persons as shall be appointed Receivers in the said County, who shall, from Time to Time, certify the Sums, Values, or Proportions of such Subscriptions, to the Treasurers of London, nominated in the said Propositions; and shall have Power to name Receivers, and to do all other Things that the Deputy Lieutenants, or any of them, are appointed or have Authority to do, by the said Propositions, Instructions, or Additions concerning the said Propositions, in as full and ample Manner as if every Particular thereof had been expressed in this Order; and the said Receivers, and other Persons appointed by them for this Service, shall have as full Power to execute their Directions as if they had been appointed by the Deputy Lieutenants of the said County: And it is further Ordered, That the Persons above named, or any Two or more of them, do signify to their Country, That, out of their own Money, there shall be Allowance made for Horse, Arms, and Officers, if they will voluntarily raise any Horse for the Defence of that County."